After grabbing some ingredients at the shop and shoving a pig’s head in my bicycle basket, Felix and I rode over the Williamsburg Bridge back to the East Village while the head wobbled behind me. 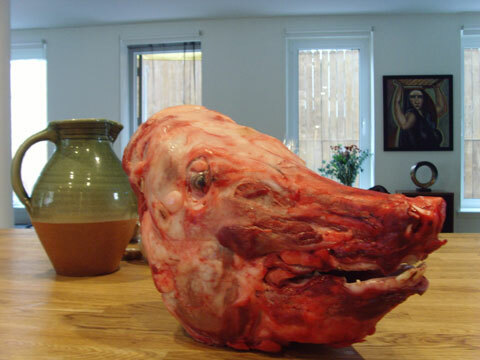 I was given the choice: half a head with the skin on from Flying Pigs Farm, or a whole skinned pig’s head sans ears. I ordered the latter and prayed for the best. I also prayed I wouldn’t hit a bump while the head flew out and smacked some poor passerby walking over the bridge. The following day, with it’s piggy snout and teeth sticking out of our too-small (massive) pot, we pulled the head out of the brine. Its nose had gone completely red and I tried not to flinch. After adding fresh water, wine, leeks, onions, garlic, carrots, celery and pepper, we dumped Sally (I had to give it a name, my god it was staring at us all day) back into the pot to simmer for 6 hours. Meanwhile, we botched up the Bartolli beans which were supposed to go in the recipe – so I braved the rain, bought another batch and tried it again. All was well. Sally was ready to exit the pot, and the true moment had arrived. Was it globular? Gross? Would an eyeball go flying and hit the floor? Felix dug a fork into Sally and started ripping through her head, collecting as much meaty-meat as possible. There was a lot of fat, about half the mass was fatty. We saved some of that and threw it back in. The eyeballs, teeth, and some of the snout stayed put. Anything else got tossed into the beans with reserved liquor, radishes, carrots, ramps and watercress for a light “wilting”. It was, indeed, a Fergus Henderson evening. Not only does he put new meaning into “pork and beans”, we made his killer “Bread & Wine salad” (Boston lettuce, mint, spring onions, red wine vinegar, lemon juice and olive oil) which was light and airy. We also added the mushy courgettes as a delcious side dish. And for desert, I fused about 3 recipes to make a fresh ginger/apple/rum-infused prune cobbler which ended the menu FULL ON. Without a doubt (and there were some doubts in the beginning) it was probably in the top 3 best dishes we’ve ever made. I don’t know how the pork and beans “emotionally bond”, but when they do – it’s magical. We sat around the table with 6 other guests and after the first few bites, everyone looked at each other with satisfaction. This was not a graphic display of Sally’s head on the table with an apple stuffed in her mouth, this was emotional bonding with beans and radishes. Poetry. Thanks, yet again, to the insanely talented Mr. Henderson for bringing us closer to our pork deity. All hail the mighty pig. We even plucked 3 teeth to remember Sally and her excellent, lovely head.